Get fast wifi coverage in every single part of your home. Even when everyone in your home is online at once, you can still download shows, stream movies, play games and more with Panoramic Wifi and Cox High Speed Internet. Panoramic Wifi connects a network of devices that cover your whole home, from top to bottom, around every corner. Get fast wifi in every nook and cranny of your house. 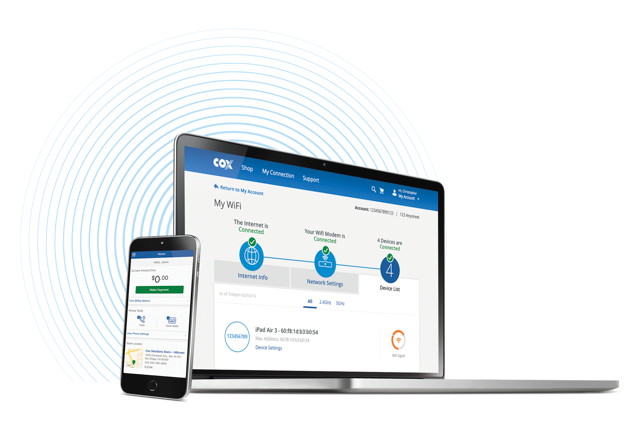 Our Panoramic Wifi Gateway works together with your Cox internet service so you have access to our fastest speeds throughout your home, even if everyone is online at the same time. In your cart, add the Panoramic Wifi Gateway for $10.99 more/mo. How is the Panoramic Wifi Modem different than the other modem you offer? The Panoramic Wifi Gateway is the only Wifi Modem Cox offers for rental. This device combines a DOCSIS 3.0 24x8 cable modem with a powerful 4-port gigabit wired router, dual band 802.11ac wireless router, MoCA 2.0 for extenders and eMTA for optional phone service. The Wireless router supports 802.11 a/b/g/n/ac with 3 transmit antennas and 3 receive antennas, and performs as well or better than $150 Wi-Fi routers available from third parties. The DOCSIS 3.1 Cable Modem does not provide a Wifi experience. How is Panoramic Wifi from Cox different from Luma, Eero or Google Wifi? With a Cox Panoramic Wifi Gateway rental, we’ll make sure you have the latest software/firmware on the device. And, when it becomes obsolete, we’ll replace it. If it breaks, we’ll replace it. If you would like to manage your own network, we offer easy tools like the My Wifi app to help you do that. If you need help, our technical phone support is open 24/7 for assistance. If you experience wifi issues that need further troubleshooting, we’ll come to your home for free to find the best solution. Our professional installation includes a Wifi signal strength assessment to ensure full wall-to-wall coverage, identification of any dead zones and recommendations for the best solution. Why am I required to rent the Panoramic Wifi Gateway? The Panoramic Wifi Gateway is only available for a monthly rental fee to our customers. This ensures that we have the capability to upgrade the software and firmware on these devices to add functionality and protect and manage devices connected to our network. This also ensures that as technology evolves, we are able to ensure our customers receive the newest and best devices in their home. What are Wifi dead zones? Dead zones refer to areas within a Wifi network where signal is unreliable or absent. They can be minimized or eliminated by placing your router in an unobstructed location such as on top of high furniture or "line of sight" locations. In instances where obstructions can't be avoided, such as between floors or around walls in large square-foot homes, Panoramic Wifi can eliminate dead zones. Can I buy the Panoramic Wifi Gateway? Our Panoramic Wifi Gateway is only available for rental. This ensures that all of our customers receive the latest, top-end equipment and ensures they do not get “locked in” to a device when technology changes. You may provide your own modem, wifi router or combination device (click here for a list of supported devices). However, we will not be able to provide any support for your home network unless you rent the Panoramic Wifi Gateway Modem. This allows us to provide the best experience and support possible to our Wifi customers. What's the difference between Panoramic Wifi and mesh Wifi? Traditional Wifi networks work on a Linier configuration, where the main router controls and talks to each individual access point. A mesh network has multiple extenders that can each talk to each other. This gives greater range and reliability, but is rarely needed. I'm getting poor wifi signals or no Internet connection in parts of my home. Weak wifi signals can occur in large homes for many reasons, with the most common reason being the thickness or material within walls or floors. With a Panoramic Wifi Gateway, you can avoid poor wifi signals and improve your overall internet connection in all areas of your home. 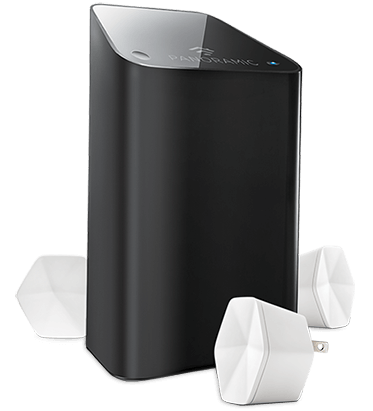 Panoramic Wifi Pods enhance coverage to reduce dead zones and provide reliably fast wifi throughout your home.